The Account Manager from the Investors Service Centre at KDIPA receives the potential investor. The Account Manger generally reviews the project proposal and the expected deliverable against KDIPA’s goals and set criteria. 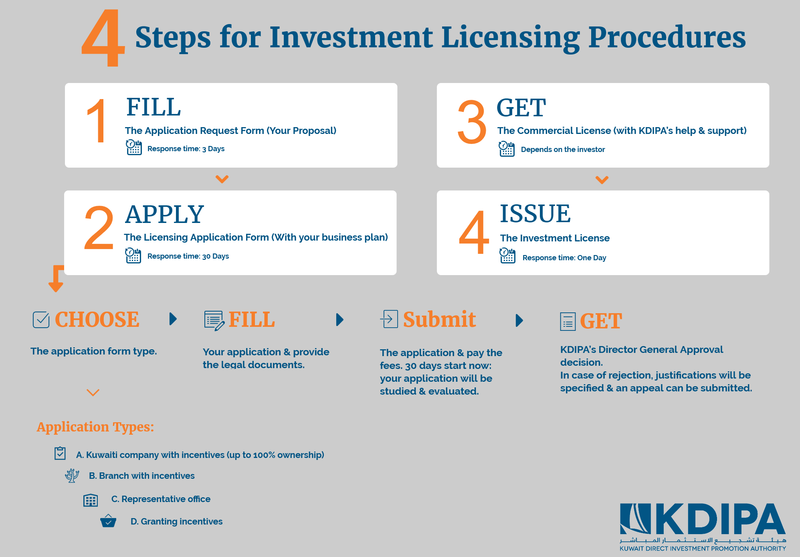 The Account Manager from the Investors Service Centre at KDIPA helps potential investor in filling the Licensing Application and provides any needed clarifications for preparing the Business Study in accordance with the Introductory Guide. The Account Manager ensures that the application is complete and all required documents are attached. The potential investor pays the set fees for submitting the application in accordance with the approved service fees list. The project gets studied & evaluated, recommendations are raised to the director general. The Director General of KDIPA issues a decision approving the application that satisfies all requirements, and the investor is informed accordingly. In case of rejection, the justifications are specified, and an appeal can be submitted. Note: The issuance of the decision might take longer if the activity to be licensed require several approvals by competent authorities. The Account Manager at KDIPA assists the investor who obtained the approval for the investment license application in issuing the needed commercial license from the Ministry of Commerce & Industry and other competent authorities. Duration: Depends on the Investor. Upon completing the issuance of the commercial license of the investment entity approved, KDIPA issues for it the Investment License. Fees for issuing the Investment License is paid in accordance with approved service fee schedule. The Investment Entity is then recorded in the Investment Registry of KDIPA. The Investment Entity is given a registration certificate (To Whom it May Concern), and the fees are paid in accordance with approved service fee schedule.